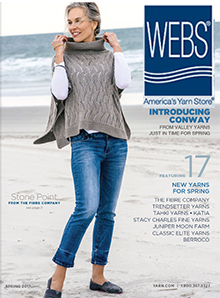 For weavers, WEBS carries a large variety of coned yarns, weaving looms and equipment as well as hundreds of books on every topic from advanced weaving and textile art to knitting for beginners. Spinners will find a large selection of spinning fibers, wheels and accessories. WEBS also offers an incredible selection of closeouts and millends. These yarns are offered at incredible savings, and their low, low prices make them ideal material for trying a new technique or medium, or for weaving or knitting for beginners. Fast, affordable shipping and a second-to-none customer service department make WEBS the only place to shop for all your spinning, weaving, textile art, and knitting needs. Visit them at www.yarn.com and make WEBS-America's Yarn Store your local yarn store, no matter where you live!